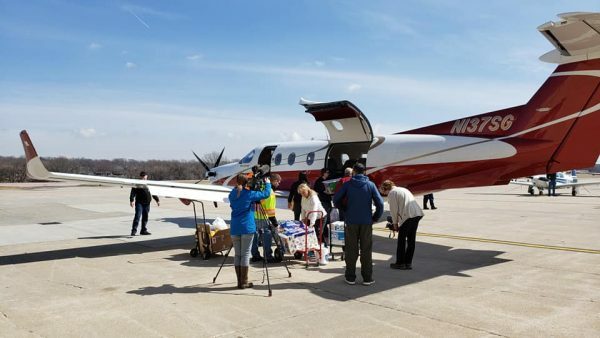 “Angels of the sky” have organized in an amazing way to bring much-needed relief those whose lives were upended this week in Nebraska by severe flooding. Over the past weekend, deadly flooding decimated Nebraskan communities, turning cities into flood plains and in the case of Fremont, an island. The waters separated families, destroyed homes, and wiped out the entire crops of some farmers, leaving many families in complete disarray. With 53 counties in a state of emergency, people of good will began the herculean effort to get aid into these flooded areas. It wasn’t long before Millard Airport was one of the places quickly filling up with supplies. In an interview with Faithwire, Rachel Tiller, a local real estate agent from Ohama, shared how sweet it was to see all the volunteer help come together. “There was nothing official about it, I shared a status on Facebook, asking pilots to donate their time, or people to donate supplies, and it blew up,” she said. “People showed up at the airport wanting to help, supplies were being dropped off like crazy, and donations were being made from people that were too far to help physically,” Tiller added. Tiller’s Facebook post garnered over 2,000 shares, and as a result, donations flooded the airport where she, among many others, were collecting supplies. Local pilots stepped in to help out, shuttling supplies to the Fremont area, and bringing people to and from the isolated weather-created island. If you want to help, but are not in proximity to Nebraska, you can donate to a GoFundMe here, that Rachel Tiller set up in order to buy more supplies. So far, around $2,000 has been donated to help the Nebraska flood aviation relief. In the meantime, pray for the communities affected by the flooding, including farmers who lost everything, families whose homes are ruined, and cities that will need to rebuild.